What problems can IoTeX solve? The Internet of Things has rapidly evolved over the past few years, but lacks real world “killer applications”. McKinsey & Company predicts that IoT could generate up to $11.1 trillion per year in economic value by 2025. Despite the massive potential of IoT, there are roadblocks ahead, such as lack of scalability, privacy concerns, and lack of functional values. IoTeX is solving these problems by creating a flexible, privacy-centric blockchain infrastructure tailor fit for IOT, leveraging a blockchain-in-blockchain architecture with cryptoeconomic incentives. By combining token incentives with community efforts, we can crowdsource industry and community contributions to address various technical challenges related to IoT architecture, infrastructure, and implementation. What are IoTeX’s competitive advantages? At a high level, IoTeX's competitive advantage stems from four main innovations: 1. Blockchain-in-blockchain architecture which ensures privacy and prevents IoT information leakage; 2. Built-in privacy based on lightweight cryptography; 3. Real-time consensus with instant finality, which improves the throughput of the network, reduces transactional costs, and enables efficient cross-chain communication; and 4. Subchain-as-a-service (SAAS) to facilitate fast prototyping and production of new IoT applications and ecosystems. No, IoTeX does not use directed acyclic graphs (DAG). IoTeX believes that DAG is an interesting technology, but is still in its infancy. What is an IoTeX token? How does it work? One of the key factors affecting monetary value is inflation. We plan to address inflation by fixing the total supply of IoTeX tokens from the start at 10 billion tokens. Prior to the launch of the IoTeX Mainnet, the circulated IoTeX token will be an ERC20 token (ticker: IOTX), which is not mineable. Immediately after the launch of the IoTeX Mainnet, we will work with exchanges to help IOTX token holders redeem their ERC20-based IoTeX tokens for the native IoTeX tokens (ticker: IOX). The native token will be mineable, similar to PoS, for 50 years. Rewards of the mining will reduce over time based on a linear gradient reduction model. We have released our first Testnet preview, StoneVan, on April 20, 2018. 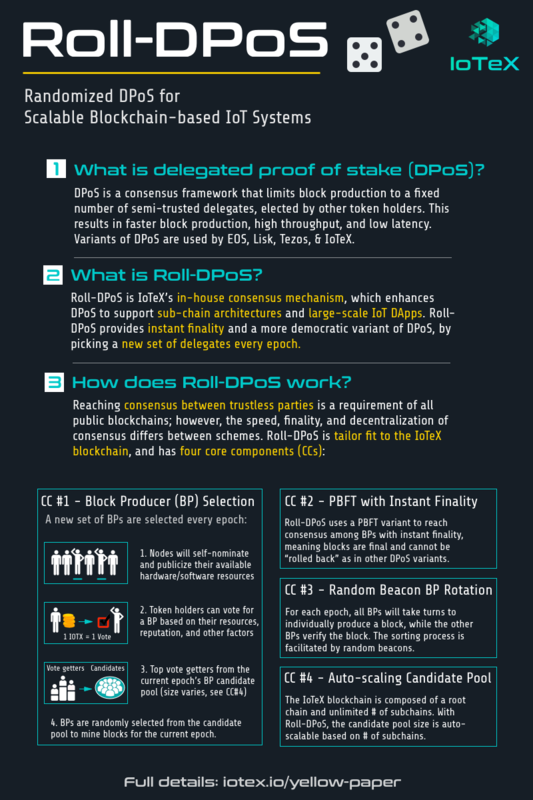 Our next code release will be Testnet Alpha in late June, which will include the first implementation of our full Roll-DPoS consensus scheme with voting support. IoTeX’s long-term plan focuses on building IoTeX subchains, software development toolkits (SDK), and developer tools, as well as collaborating with IoT companies / developers to build DApps utilizing the IoTeX platform. Please see the latest full version roadmap on the home page. Can other projects launch their own token on IoTeX blockchains? Yes. IoTeX's mission is to allow developers to easily create their own robust and useful subchains for their own projects and ecosystems. Subchains are meant to be flexible, meaning they can choose to use their own tokens or the IoTeX token, can be programmed in a variety of programming languages, and can be made permissioned (private) or permissionless (public). If you have ideas or plans with regards to your own subchain or token, please reach out to us - we would love to help you design your own token economy! Was there a whitelist or public token sale? There was not an ICO/public sale. Instead, we held a private sale in February 2018 and have held various community reward programs and other events to allow our community members to earn points. We are planning a number of new community reward programs in the coming months. What are the token metrics? How are the tokens distributed? The exact dates will be subject to change based on unforeseen circumstances. As always, we will announce the exact release date and time before the event and give the community enough time to prepare and minimize the amount of surprise. Also, every batch token release will be processed gradually over the course of several days/weeks to manage fluctuations in price. 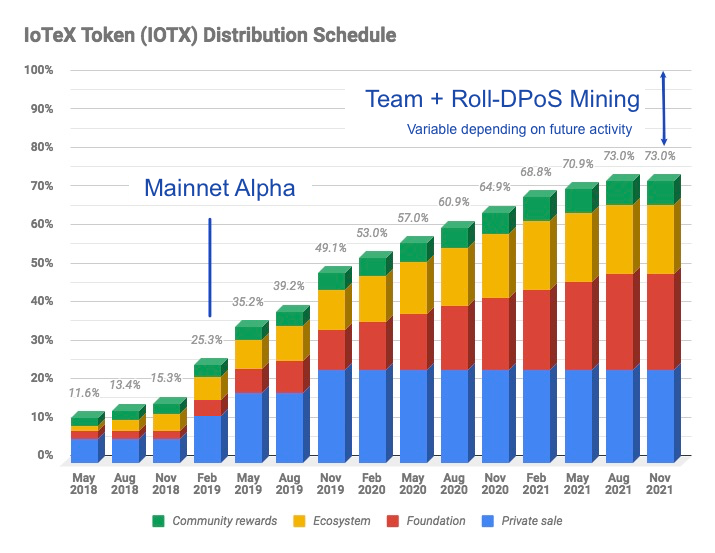 For more information, please see our detailed token distribution schedule here. Our social media team monitors our social media outlets regularly and will reply to your comments and questions on each individual platform. For potential collaborations, please email us at [email protected].